The Hollyford Track is a fantastic 4-8 day Fiordland tramp from the mountains to the sea at Martins Bay, and can be walked all year round. 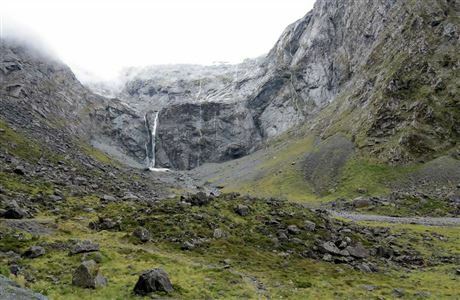 Beginning among the sheer rock walls of the Darran Mountains in Fiordland National Park, the track follows the Hollyford River/Whakatipu Kā Tuka on its journey to the sea at Martins Bay, on the wild West Coast. With no alpine sections this track is rarely cut off by snow so you can tramp it in any season (depending on weather). The first part of the track offers a great overnight option for families or those with limited time. The Hollyford Track gives you a fantastic all round experience of Fiordland National Park. 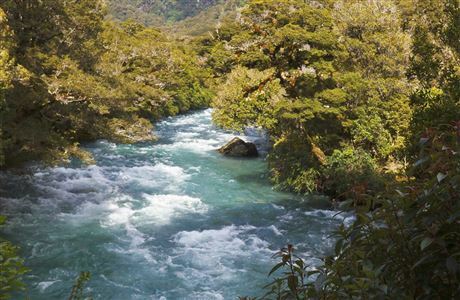 You begin at the most impressive Fiordland terrain in the Darran Mountains area, and tramp for 4-5 days down the Hollyford River/Whakatipu Kā Tuka to the sea at Martins Bay. You will walk through lush forest, beside a mighty river, alongside beautiful lakes then out to the wild West Coast. With no alpine sections, this track is rarely cut off by snow so you can tramp it in any season (depending on weather). Even in the rain this valley is still lovely for day walks or tramping, unlike walks in exposed alpine areas (however flooding can sometimes affect the track so check conditions before you go). The Hollyford Track has excellent, comfortable huts and a good track, but is still a backcountry experience in Fiordland National Park. It’s a good trip for you if you are fit, and like being a little off the beaten track, but still want a good, well marked track and huts to stay in. Nearing the coast, you may be lucky enough to see native wildlife, including NZ fur seals, penguins, herons, and occasionally dolphins. 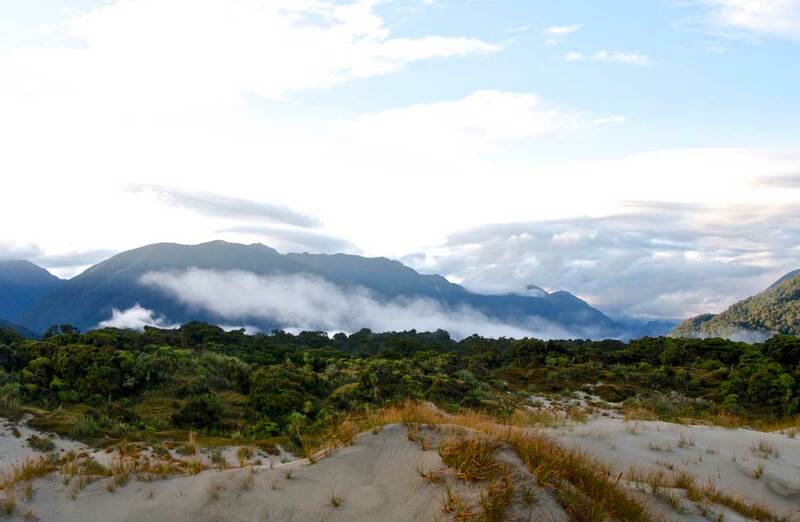 Other activities in the Hollyford Track area include day walks, guided walks (day or multi-day), climbing, trout fishing, deer hunting and kayaking. Also, if you are a skilled and experienced tramper you may like to extend your adventure to include the challenging Pyke – Big Bay Route. The Hollyford Track begins at the end of the Lower Hollyford Road, off of SH 94 Milford Road, and ends at Martins Bay on the west coast. The track is suitable for people with good fitness and takes 4-5 days one way. You can return on the same track or arrange transport from Martins Bay. Very skilled and experienced trampers may choose to return via the challenging Pyke - Big Bay Route. All huts are on a first come basis year round, there are no reservations. There are 6 backcountry huts along the track. You can camp beside the huts. You need hut tickets or a backcountry pass, available from any DOC visitor centre. During holiday periods you may wish to carry a sleeping mat or tent in case huts are full on arrival. Each hut has heating, mattresses and a pit toilet. There are no cooking facilities, carry your own portable stove. Topo50 Map CA08 - Milford Sound/Piopiotahi. some parts of the track are prone to flooding in wet weather - see know before you go. Cross the swing bridge over Humboldt Creek and follow the old road to the start of the track, which initially sidles along bluffs, with swampland to the left. Sections of raised boardwalk cross areas prone to flooding. Where Swamp Creek joins the Hollyford River/Whakatipu Kā Tuka, the track follows the river bank, with occasional views of the Darran Mountains. At Hidden Falls Creek the track passes Sunshine Hut (private hut) then continues upstream to a swingbridge. Hidden Falls Hut is about 15 minutes from here. The track passes through a section of lowland ribbonwood/podocarp forest draped with colourful mosses and ferns. It then enters tall beech forest before the climb to Little Homer Saddle, with views of Mt Madeline and Fiordland’s highest mountain, Mt Tutoko (2723 m). The track descends to Little Homer Falls (60 m) and continues to the Hollyford/Pyke Rivers confluence. Beyond this is Pyke River Lodge (private) and 15 minutes further on is Lake Alabaster Hut. This section of the track is maintained to a much lower standard than the Lower Hollyford Road end to Lake Alabaster section. Use the orange markers on the trees to guide you. It can be muddy, rocky and wet underfoot. Tree falls may obscure the track. Be aware that after heavy rain the river can flood and you may be stranded in the hut until river levels are lower and it is safe to cross. Back track from the hut for 15 minutes and cross the Pyke River swing bridge. After two hours of relatively level track, the track meets the Hollyford River/Whakatipu Kā Tuka again. There are some long sections of mud. A further hour’s walk leads to McKerrow Island. To access the hut, cross the flood channel above its entry to Lake McKerrow/Whakatipu Waitai. Demon Trail is a historic cattle track. This section is rocky and undulating, but there are long sections of formed, flat track in between. It can be difficult underfoot in wet weather, with the track becoming slippery and with loose rocks. 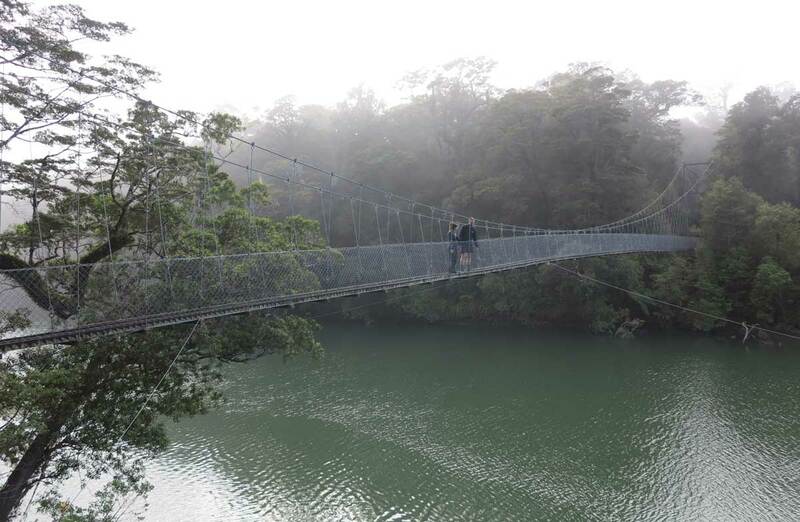 Some of the stream crossings can be dangerous, so extreme care is required - using the three wire bridges is recommended. After heavy rain some streams may be impassable. Thirty minutes walk from Hokuri Hut is Hokuri Creek. In low river conditions cross near the creek mouth, otherwise use the three-wire crossing 20 minutes upstream. Follow the lake shore past the bay where the settlement of Jamestown once stood. After a further 1.5 - 2 hour's walk, the track leaves the lake and continues for another hour to the Hollyford Airstrip and Martins Bay Lodge (private). Martins Bay Hut, situated at the mouth of the Hollyford River/Whakatipu Ka Tuka, is a further 1.5 - 2 hours from Martins Bay Lodge. Take care when crossing Jerusalem Creek as it is prone to flooding after rain. There is also another airstrip and private baches in this area. The track continues on to Long Reef through wind-shorn forest and provides views of the river mouth and sand spit. From July to November, seals and Fiordland crested penguins/tawaki can be seen around the coast close by. Beyond Long Reef, the track becomes the Pyke - Big Bay Route. This route is not as well defined and suitable only for well-equipped and experienced trampers. The Hollyford Track begins at the end of Lower Hollyford Road, which turns off of SH94 Milford Road shortly after The Divide. 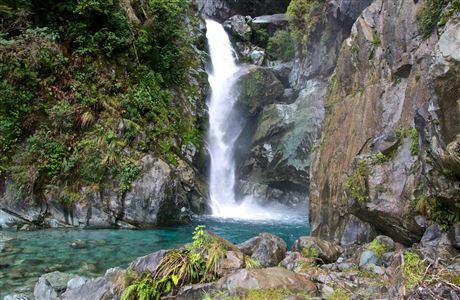 The turn off point is called Marian Corner, and is about 87 km along the Milford Road from Te Anau. Allow 2 hours to drive from Te Anau to the end of the Hollyford Road. There are regular transport services available during the summer season. During winter they are on demand only and may not be available. There are fly-bus packages available, offering transport between Te Anau, the Hollyford Road track entrance and Milford Sound. During summer, there is a jetboat service available on Lake McKerrow on certain days with the Hollyford Track Guided Walk. Advance reservations essential. The boat goes from Martins Bay to the Pyke River confluence. Plan properly for your trip and make sure your group has a capable leader. Be sure you have all the necessary equipment and clothing. Physical fitness and good equipment will make all the difference to your enjoyment of the trip. Always tell someone you trust where you are going and when you are due back. See Safety in the outdoors for details. Check current track conditions before you go with the Fiordland National Park Visitor Centre in Te Anau. Sections of the track can become impassable after heavy rain, especially along the Demon Trail area, and at the Jerusalem River between Hokuri and Martin’s Bay huts. Some sections are rough and muddy and not well defined. Orange markers will guide the way. Hokuri Creek is bridged but if you choose to cross it, note that it looks tame but is disconcertingly swift. Stay on the tracks. If you become lost - stop, find shelter, stay calm and wait for searchers to find you. Be prepared for at least one wet day on your trip - Fiordland is a high rainfall area. All trampers need to carry a sleeping bag, cooking stove and equipment, sufficient food, first aid kit and good waterproof / warm clothing including gloves and hat. What are sufficient supplies? See Mountain Safety Council for details. Bring spare clothing for evenings. It is not possible to dry clothes in the huts. Most equipment is available for rent or purchase in Te Anau.